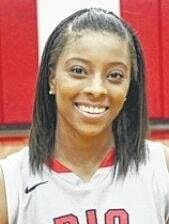 BEREA, Ky. — University of Rio Grande women’s basketball standout Brianna Thomas has been named the 2014-15 Kentucky Intercollegiate Athletic Conference Female Athlete of the Year. Thomas, a senior from Newark, N.J. and a second team NAIA Division II All-America selection, averaged a team-high 18.0 points, 5.4 assists and 3.9 steals per game in leading the RedStorm to their first national tournament appearance since 2008. Thomas, who was named the KIAC Player of the Year, led the conference in assists and steals and ranked in the top five nationally in both categories. She also ranked 15th nationally in total scoring (595). Thomas, who came to Rio prior to the 2013-14 season from Cecil Community College and was named an NAIA Division I Honorable Mention All-American in her first season with the RedStorm, also joined the program’s 1,000-point club this season, finishing with 1,205 points over the course of her two seasons. She finished her Rio career in the top 12 on the school’s all-time leaders list in assists, steals and three-point goals, while her 178 assists during the 2014-15 campaign set a new single-season school record.